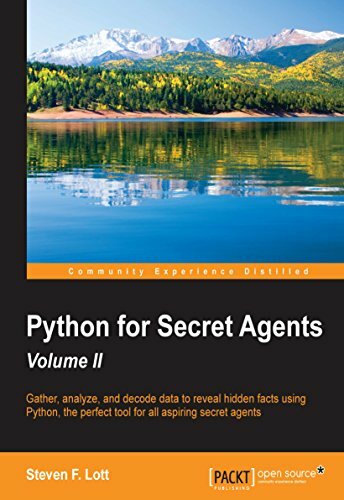 This book is for Secret Agents who have some exposure to Python. Our focus is on the Field Agents who are ready to do more sophisticated and complex programming in Python. We'll stick to simple statistics for the most part. A steady hand with a soldering iron is not required, but a skilled field agent should be able to assemble a working Arduino circuit to gather their own sensor data. Python is easy to learn and extensible programming language that allows any manner of secret agent to work with a variety of data. Agents from beginners to seasoned veterans will benefit from Python's simplicity and sophistication. The standard library provides numerous packages that move beyond simple beginner missions. The Python ecosystem of related packages and libraries supports deep information processing. This book will guide you through the process of upgrading your Python-based toolset for intelligence gathering, analysis, and communication. You'll explore the ways Python is used to analyze web logs to discover the trails of activities that can be found in web and database servers. We'll also look at how we can use Python to discover details of the social network by looking at the data available from social networking websites. Finally, you'll see how to extract history from PDF files, which opens up new sources of data, and you'll learn about the ways you can gather data using an Arduino-based sensor device. Each chapter will include a background briefing that covers an essential Python technology. After some in-depth exploration of the features, the chapter will conclude with a mission that is a concrete application of the Python tools and techniques covered.